As of November 15, 2017, I have updated this tutorial by transferring images to imgur. So, once photobucket shuts accounts down (that don't pay their $400/year), this tutorial should not be affected. As always, if you have any questions, don't hesitate to contact me. Greetings to my fellow Jedi and to our padawans!!! Over the past several years I've studied the Jedi Costumes of Star Wars and have found a poor number of quality sites with tutorials. There are some tutorials out there, but since the activity of those sites have waned, many of the picture links are now broken, rendering them all but useless. So, I decided to develop a tutorial for Jedi costumes as I made mine. These tutorials have been posted elsewhere and has been met with great success. 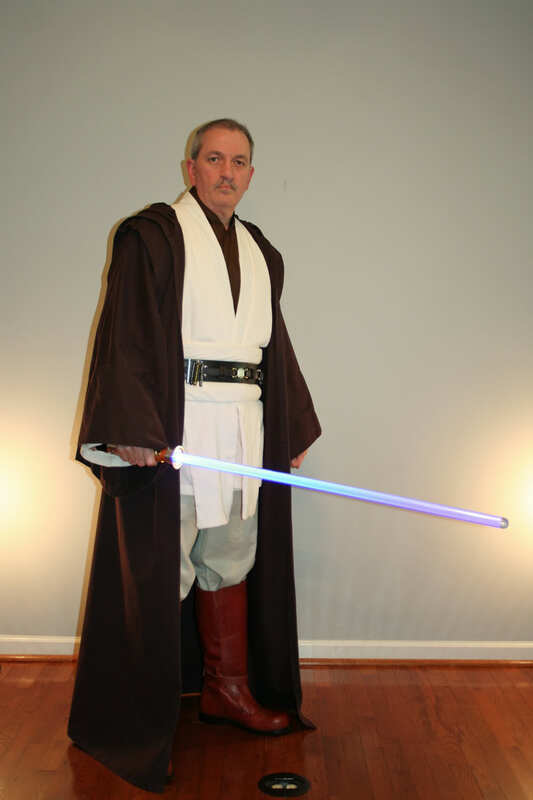 I'm very proud and excited that many people have now used my tutorials to make their own Jedi costumes. All tutorials will be updated as needed and/or as the designs are improved. Everything you see is a work in progress and I am open to comments, suggestions and critiques. Please feel free to contact me via PM or email concerning your costumes. I'm more than happy to help! 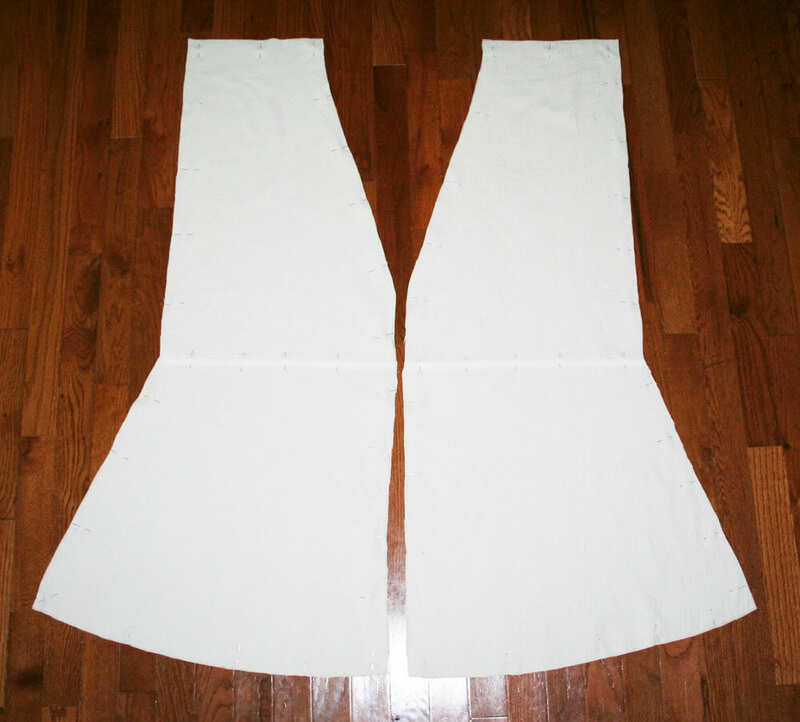 The tutorial that follows is for the Inner and Outer Tunics, and includes the tabards and obi. 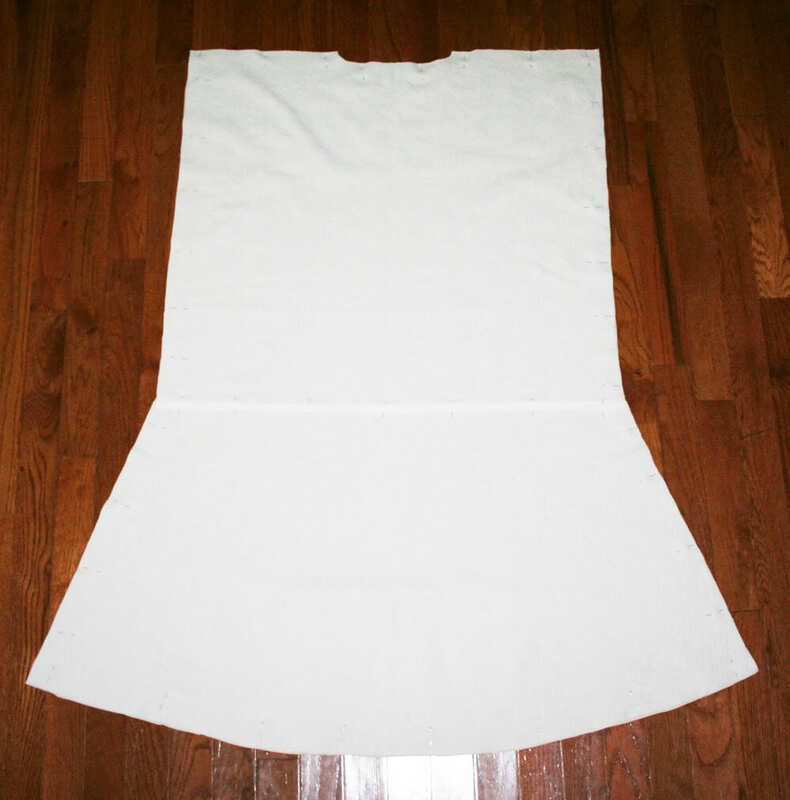 This tutorial includes instructions for the Outer Tunic, Obi, Tabards and Inner Tunic. Also, the pictures in this tutorial are large, which is done on purpose so you can use the "save picture as" option for downloading these pictures to your hard drive for your personal references. The greatest asset of the Rebel Legion and the Crazy Old Wizards site is its members and their willingness to offer suggestions and advice in an open and friendly format. Several folks, including TheRebelAgent (the one and only chief admin of the COWforums), Ember, Padawanlearner and Defyitall (among others) have been very helpful in my foray into Rebel Legion costuming and I greatly thank them for their input. I will also tell you that, other than sewing a couple of projects in high school (for me, some 30 years ago), I have never sewn…and that, since my high school days, I had forgotten everything I learned, which wasn’t much. I considered using some of the exceptional vendors discussed on COW to make my OBK costume, but the better vendors were asking well over $300 for just the outer tunic, obi and tabards. Having just spent the money for an armored Darth Vader, I chose to give sewing a try. 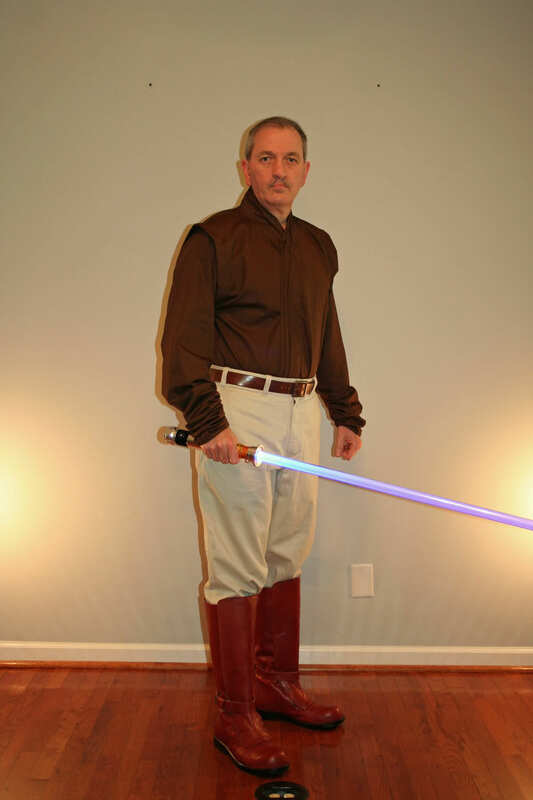 I’ll tell you that my costume was approved under the Generic Old Republic Jedi category of the Rebel Legion as well as at the Knights of the Jedi Order! My point to telling you this is…if I can do it, you can too! Now on to the tutorial!!! 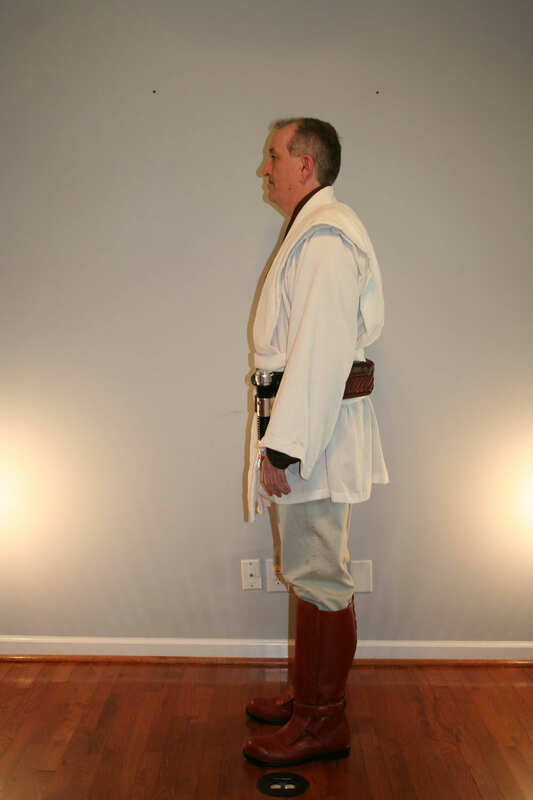 Although this tutorial will specifically talk about an Obi-wan Kenobi (OWK) costume, this tutorial can be easily modified for other Jedi costumes! There are as many ways to create an OWK costume as there are members on these forums. What follows are my experiences in making an outer tunic, obi & tabards and inner tunic. I am open to discussion and hope to learn even more from you guys in order to improve my pattern and techniques as I sew future costumes. And I will sew future costumes because I’ve also learned that sewing is…fun! Tip #1: If you’ve never sewn, I would suggest you go to your local fabric store and buy a really cheap cotton fabric to practice running through the tutorial before working with the “real” fabric. You should be able to find a cotton fabric for easily less than $2 a yard (and perhaps even close to $1 per yard). Buy at least 10 yards. You’ll spend less than $20 and will thank yourself for the experience you’ll gain before working with the more expensive fabric for your actual costume. Oh, and don’t forget the thread! Another suggestion would be to visit your local Wal-Mart or Target (or similar department store) and pick up a cheap set of sheets. Flat twin sheets with a thread count of less than 200 often sell for under $4 each. Getting two twin flat sheets should be enough. Fabrics or JoAnn’s Fabrics, carries this material. So, the really difficult part to finding the right fabric is the finding the right color. 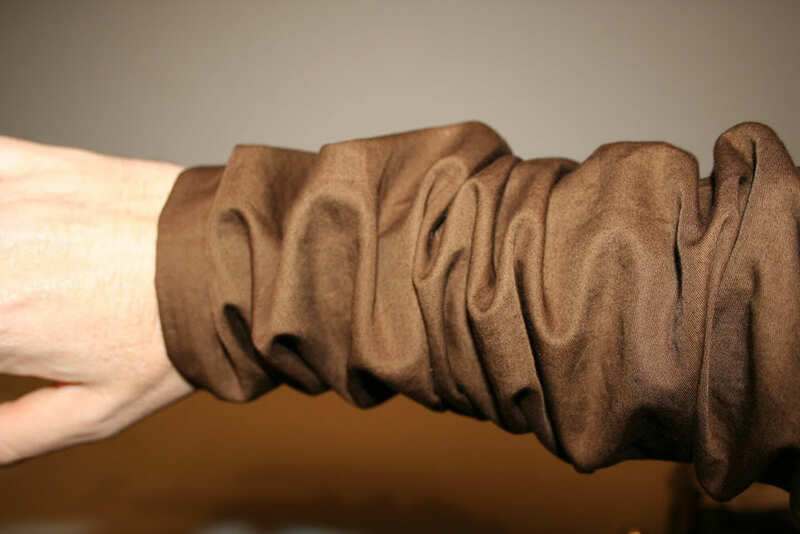 Any fabric in the ivory, tan or beige color families are good. Granted, if such colors are not available, then buying white cotton gauze and dying the fabric is the next best choice. Keep in mind these fabrics are often thin and see-through. You may consider doubling the material when you make your costume or putting in a liner. 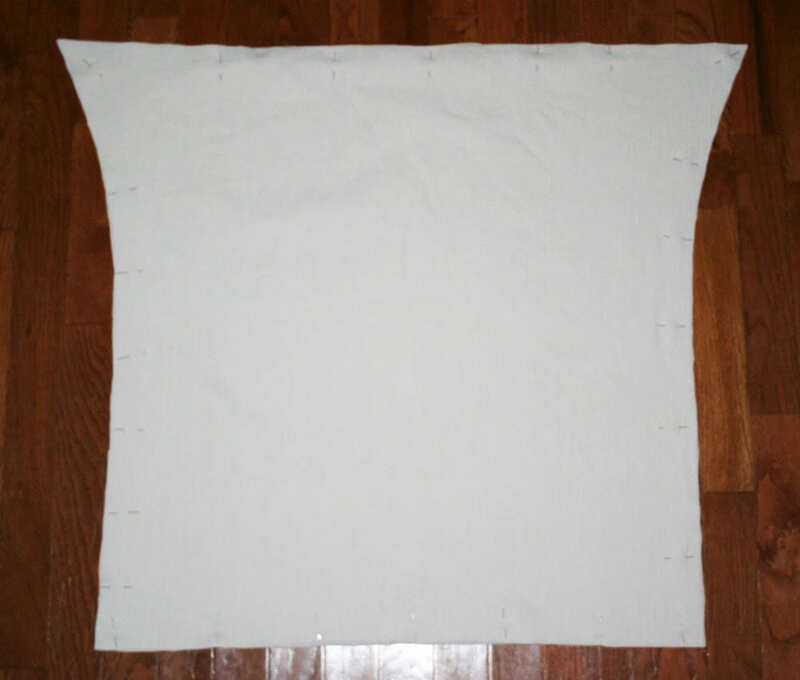 Once you’ve acquired the desired cotton gauze (and liner), the next step is to wash an iron the fabric in order to preshrink the material before cutting the fabric and sewing your costume. 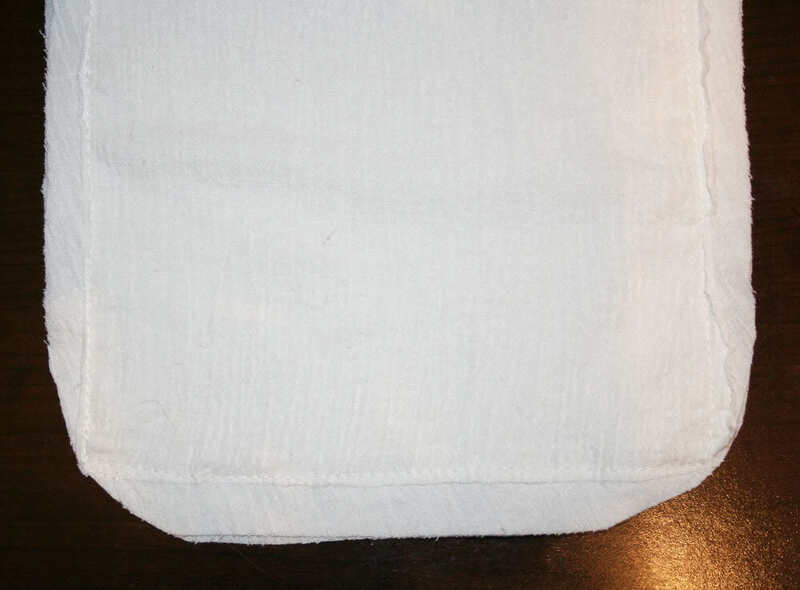 The fabric I used was ivory cotton gauze purchased through Hancock Fabric’s website. I used a flax-colored satin (a cotton/polyester blend purchased at Hobby Lobby) that was a light brownish-golden color with a shiny sheen on one side. I haven’t figured the exact amount of fabric that I used, but I’m guessing somewhere around 10 yards of the ivory cotton gauze for the OT, the obi and tabards and just less than 6 yards of lining (and I lined the whole of the OT). This may seem a bit much for the OT, obi and tabards, but I chose to make my tabards without a shoulder seam, and the material for the obi (as seen in the films) is cut against the bias (or diagonally across the bias) which takes a bit more fabric, otherwise. A few years ago, I ordered the Simplicity 4450 pattern that has since been discontinued. The pictures on the cover of the pattern look very close to the Obi-wan tunics as seen in episodes I, II and III, but there are several things about the pattern that make it less than screen accurate. All in all, however, it is a good basic pattern that can be easily modified to suit just about any Jedi costume seen in any of the movies. Over the course of a few months, and with help from several at COW, I modified the pattern to be closer to that seen worn by Ewen McGregor in Revenge of the Sith. The following are pictures of the pattern pieces I used to create my first OWK costume. Understand these pictures are not to scale, and are a bit skewed due to the angle of the camera. The measurements are correct for my costume, so anyone should be able to draw a pattern for themselves based on these pictures (and using my measurements). The sizes for the Simplicity 4450 pattern are big and I found the “large” to be big on me, so I modified the size of the pattern to fall somewhere between the “medium” and “large” sizes. For reference, I will tell you that I am an average-sized person and stand about 6 feet (or 183 cm) tall (without shoes) and weigh about 180 pounds (or 81 kilos). I generally wear a 42 Long suit coat. I actually used measurements from a suit coat, a dress shirt and a run through with the pattern using some cheap material in order to modify the pattern to fit me. Finally, keep in mind that this costume looks a bit big (especially without the obi in place), but jedi clothes should be a little large for comfort and ease of movement. Honestly, other than scrubs (that I wear in my daily work) I find the Jedi tunics to be the most comfortable clothes I’ve ever worn (too bad we can’t wear them all of the time…or can we?). Also, keep in mind that Ewen McGregor is smaller than me and somewhat on the “skinny” side, so his costume looks a bit different on his body that it will on yours, even if you manage to make a perfectly screen accurate costume…unless, of course, you’re the exact same size as Mr. McGregor. NOTE: If you follow through the tutorial and understand the logic by which I modified the 4450 pattern, you can easily make a pattern to not only fit you, but you should be able to make modifications to make ANY Jedi costume seen in the movies. According those more knowledgeable, the lower portion of the OT is a skirt. 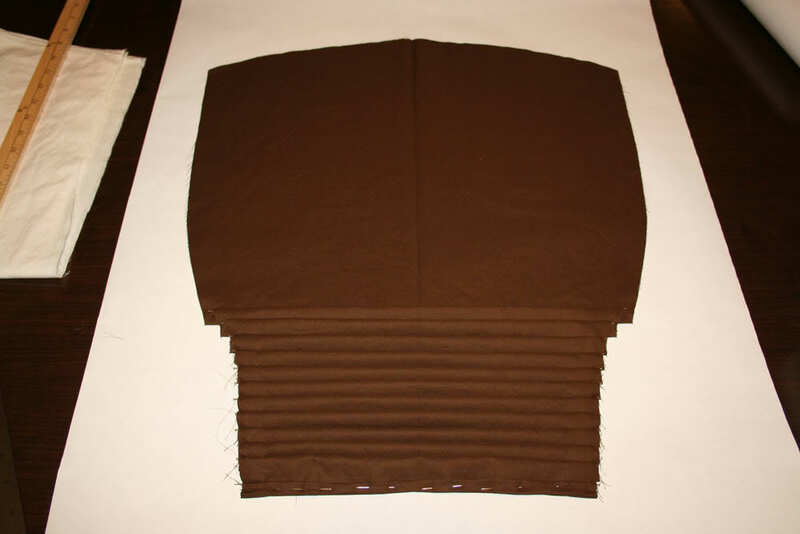 Apparently, in the actual movie costume there’s a seam along the waste of the OT where a skirt is sewn to the upper portion of the OT, making the lower part of the OT a skirt, thus allowing it to drape and flow properly. This seam is hidden by the obi. 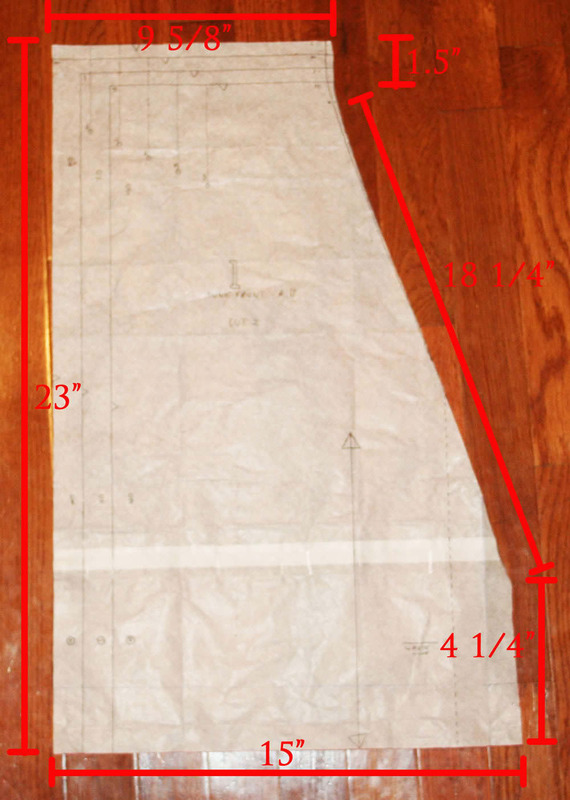 -Having gone through the Simplicity 4450 pattern with cheap material and wanting to cut the size of the pattern down to better fit me, I arrived at a measurement of 26 inches for the width of the back of the OT. There will ultimately be a side seam running from the base of the OT, up the sides and along the underside of the sleeve. I verified the measurement of 26 inches by measuring the width of the back of a suit coat and dress shirt. -We know the seam for the skirt is along the waste line. Looking at some of the reference photos for OWK, we see that the bottom of the OT falls mid-thigh or approximately 4 inches above the knee (and the tabards appear to be a couple of inches below the bottom of the OT and a couple of inches above the knee. Measuring the length between the waste and a point just above the knee came to 16 inches. I actually made the measurement for the skirt to be at about the position for the tabards because I wanted a little extra for the hem. Ultimately, I cut off about four inches of the skirt when I hemmed the OT, but I’d rather have it long than not long enough. The horizontal line of the “A” represents the position of the waste. 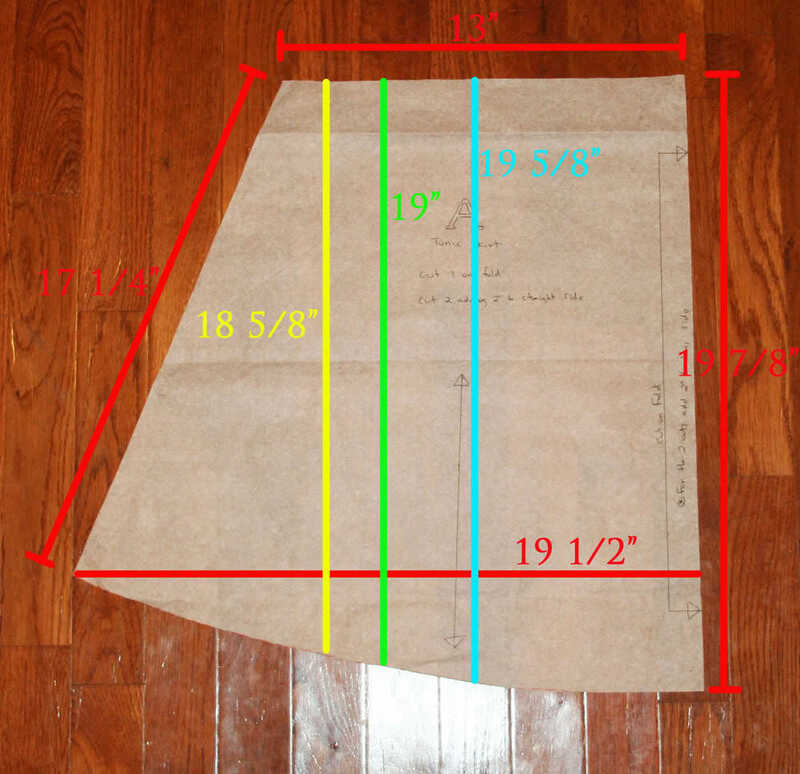 Therefore, the skirt pattern should start here. I placed tissue paper on the “A” at and below the horizontal line. 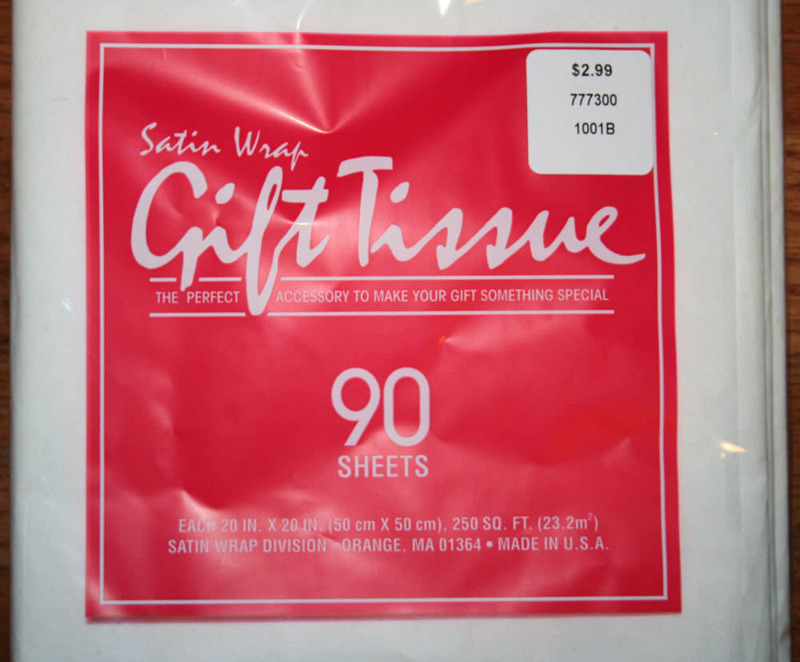 The tissue paper is the material often found wrapping gifts inside a box. In the USA, this is generally used in wrapping clothes in gift boxes. 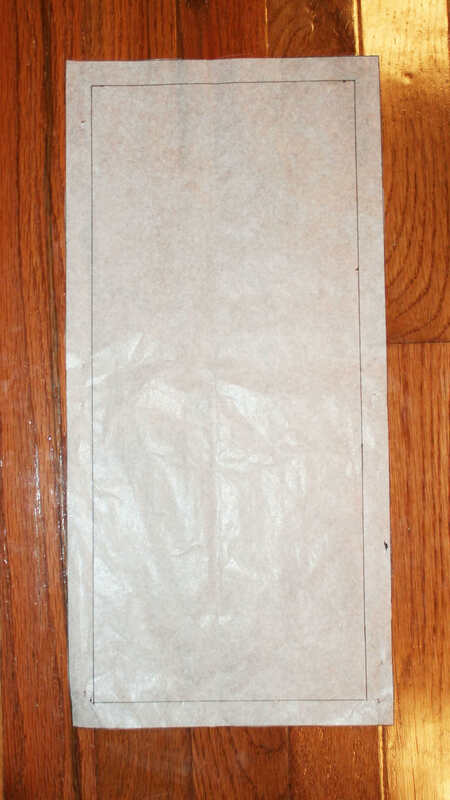 The tissue paper is thin, see through, fairly sturdy and perfect for making patterns for sewing. 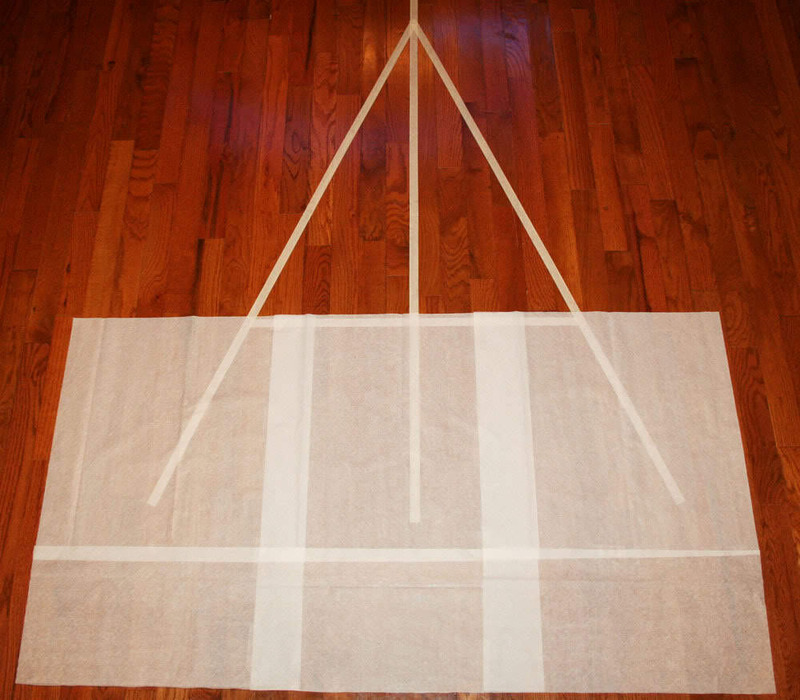 The only draw back is it comes in 24” squares, so you must tape pieces together for larger pattern pieces. Also, tissue paper can be ironed on the low setting (even with steam) to iron out the wrinkles. 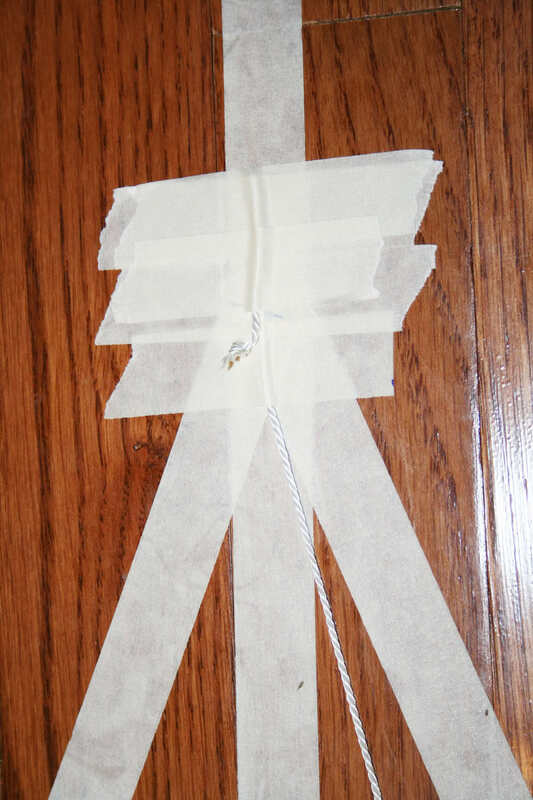 In the above picture you see three pieces of tissue paper overlapped and taped together with Scotch tape. Next, I created a pendulum using more masking tape, a piece of string (basic string that can be bought at any department store or home improvement store) and a pencil. The next four pictures shows (1) how I secured the string at the top of the “A” with masking tape, (2) the string on the “A”, (3) the string taped to the pencil at the appropriate length and tracing the arc of the skirt and (4) the final drawing of the skirt pattern. The next picture shows the full length of the original “tunic back” pattern piece from the Simplicity 4450 pattern laid on the skirt pattern. Note the overlap is considerable. 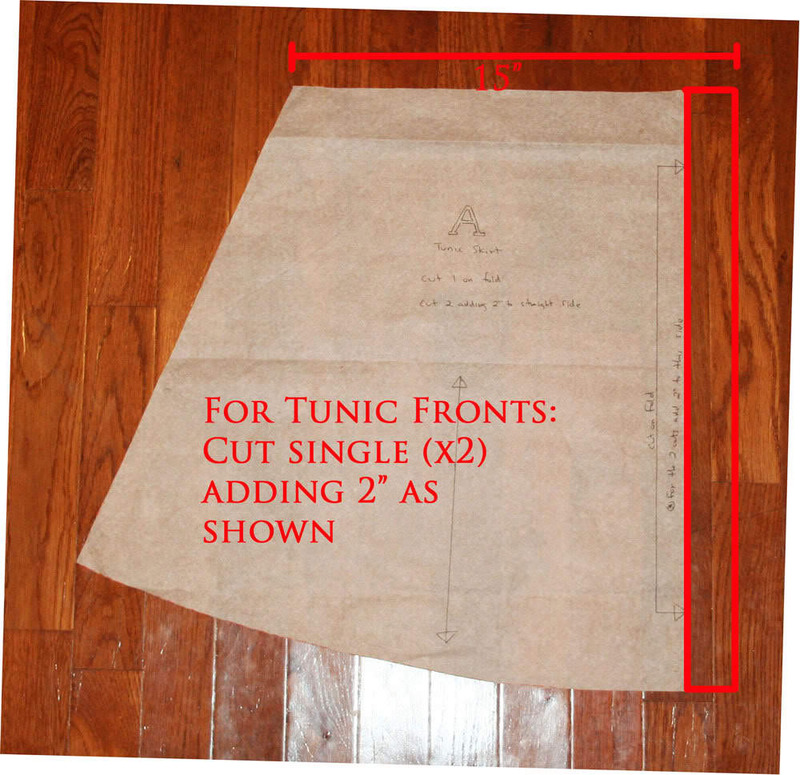 The length of the “tunic back” pattern piece will be modified (shortened) and the length should use a measurement from where the shoulder seam would be (the top of the shoulder) to the waste (1” to 2” below the belly button). Again, according to those more knowledgeable than me, the tabard is composed of two pieces that, when put together are “Y” shaped. Also, when studying the films, you can see that the grain line of the fabric is parallel to the edge of the tabard, so there must be a seam hidden somewhere under the obi. Again, the tabards, when laded out, make a "Y" shape. The back of the "Y" and the seam between the over-the-shoulder part and the below-the-obi part should be hidden by the obi. 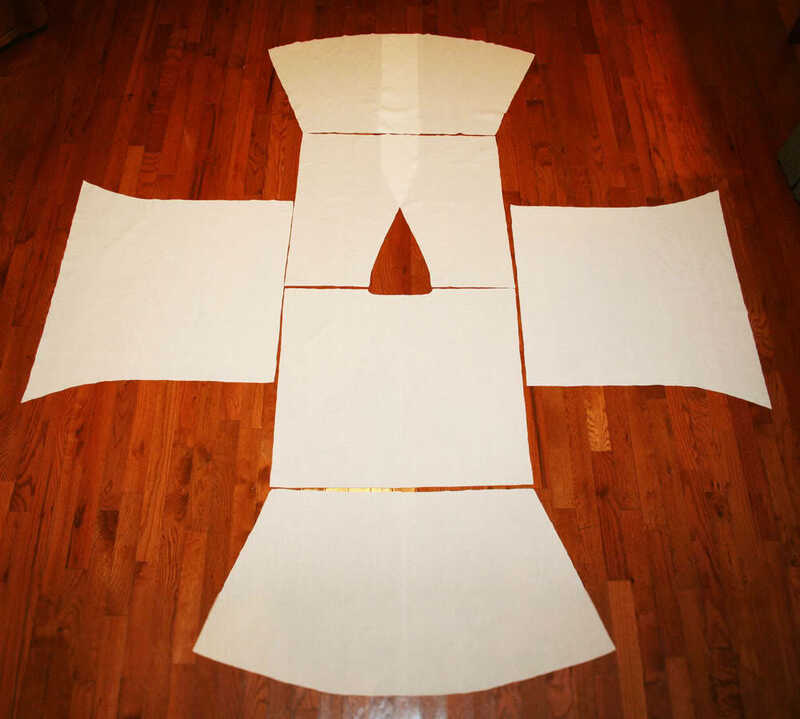 The main width of the tabards are the same width as the obi. An additional note for our "husky" Jedi is to alter the width of the tabards and obi so they are proportional to your body. 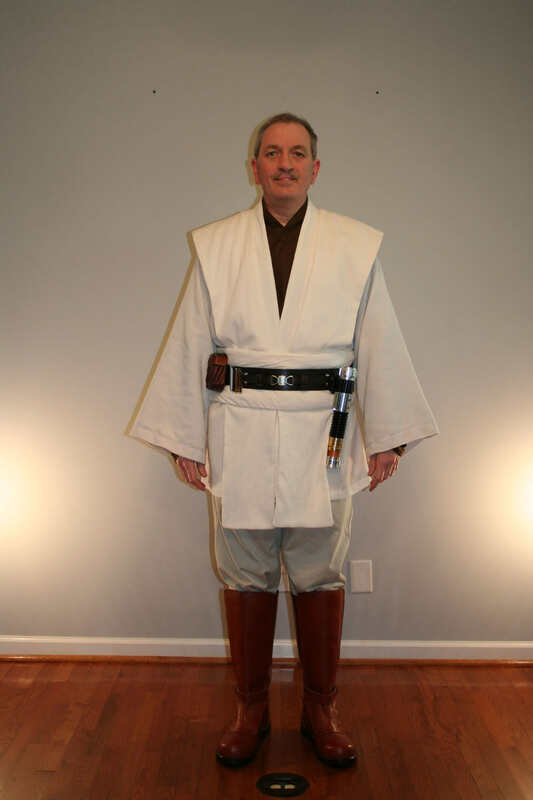 I made a Jedi costume for a dude who is about 6'4" and around 250. We made the tabards "big" because, otherwise, the tabards and obi would look small. 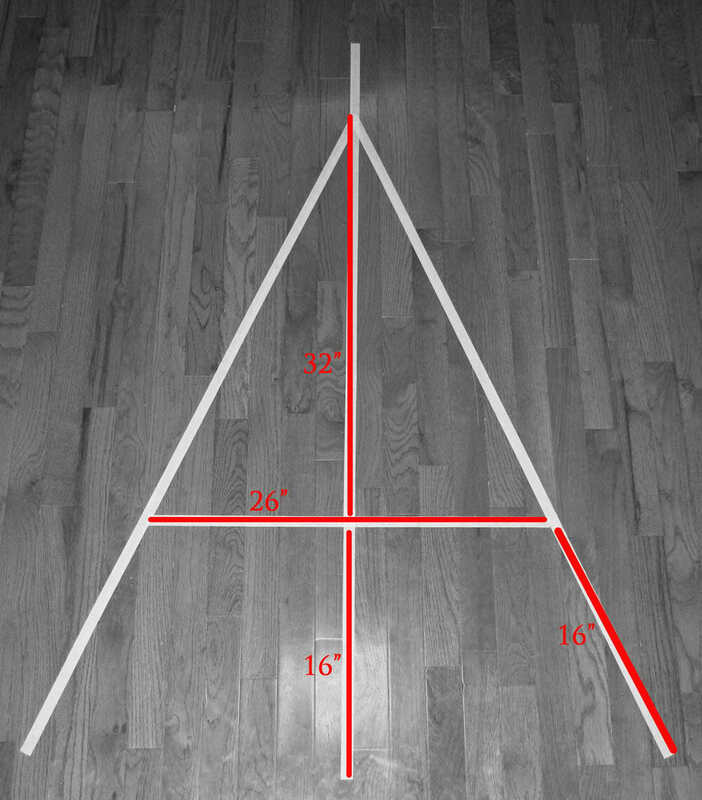 The upper left red line is 13"
The upper right red line is 12.5"
the lower left red line is 11 3/8"
The lower right red line is 12 7/8"
The distance between the blue lines is 3"
The main width of the tabard is 6.5"
The overall length on the left side is 44.5"
The overall length on the right side is 45.25"
The "bottom" pattern for the tabards (not pictured) measured 6.5"x15"
Finally, these pattern pieces show a 5/8" seam allowance. 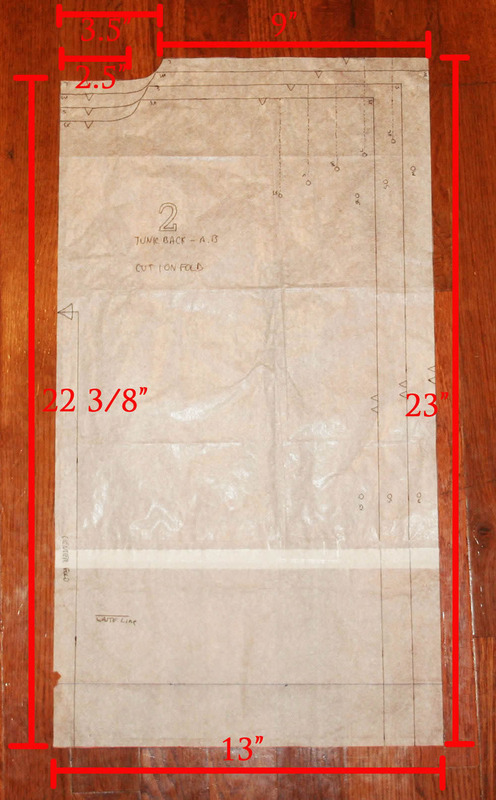 (For example...the piece of pattern paper for the bottom tabard pattern has a total width is 6.5" + 5/8" (on one side) + 5/8" (on the other side). This way, the final width of the finished tabards (except for the width at the shoulder) and obi is 6.5"...for me. I felt the tabards looked best on me when I widened them at the shoulders so they would extend from the seam at the collar to the edge of the tuck in the sleeves. 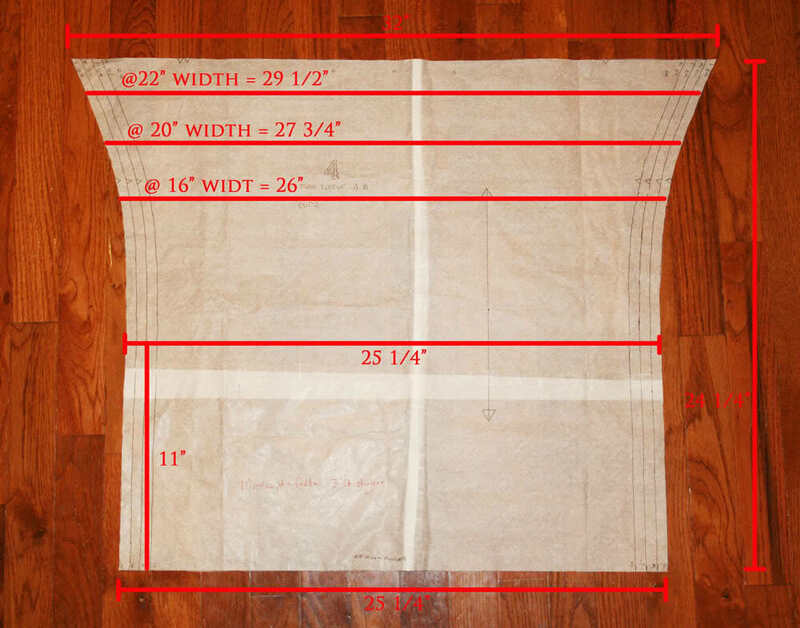 Here's my reasoning behind how I got to these measurements: I knew the tabards (for me) should be 6.5" wide. I wanted the shoulder to widen to make it look right. 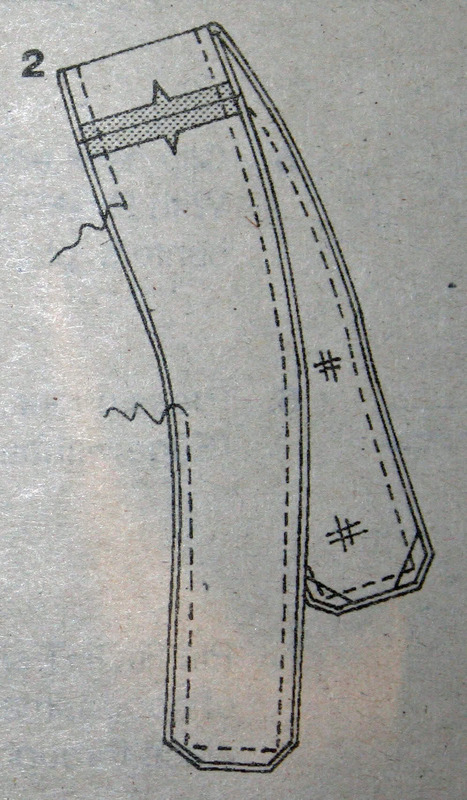 The length between the seam between joining the collar to the OT to the edge of the shoulder of the OT measured 7.5". I can't remember now, but I apparently thought it would look best for the wider part to extend 3" over the front and back. I then wanted the tabards to taper into the overall 6.5" width. Since every Jedi is different in size, the obi needs to be made to look appropriately. I chose a finished width of 5 inches. This gives about 1.5 inches above and below the Jedi Belt (which is approximately 2.5 inches wide). Here you see the Obi sewn inside out. The corners have been trimmed so that, when inverted, the corners are actually square and not rounded (from excess material being bunched up). The Tabards laid out and prior being sewn together. 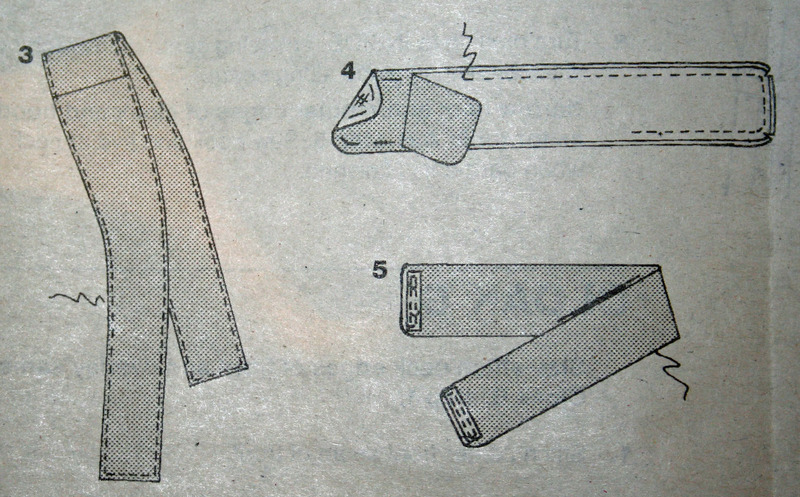 How to sew the Outer Tunic! The following is simply a copy of the pictures from the pattern with the instructions. This will give the basic method of how to put the OT together. 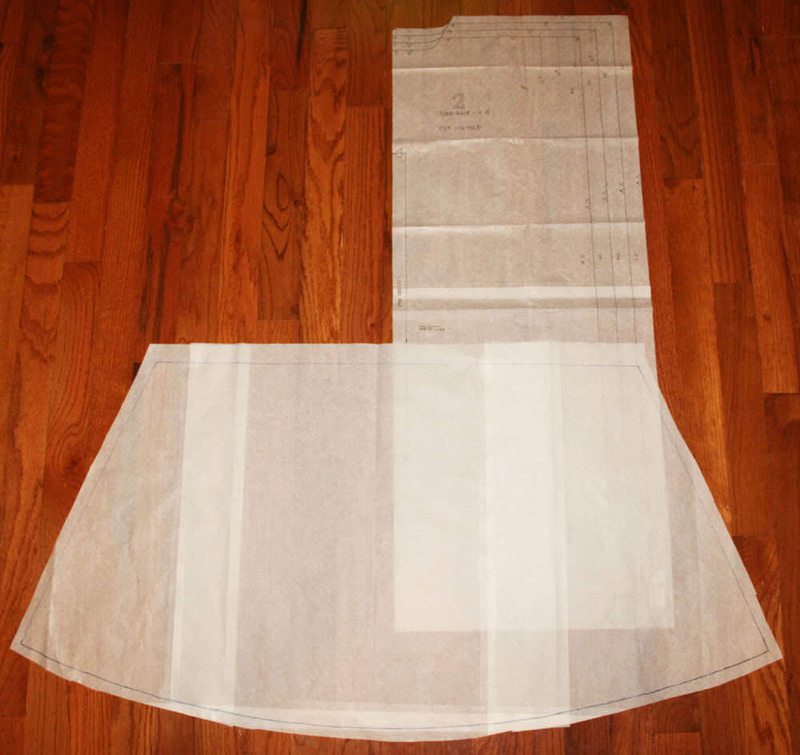 Prior to beginning these instructions, the only difference will be that the skirt portion of the OT was sewed to the back and front pieces. This will give you a definite “right” and “wrong” side. The gray shaded pieces correspond to the “right” side. The white pieces correspond to the “wrong” side. Interfacing has hatch (or tic-tac-toe) symbols. Finally, I will NOT show how I put in the liner…because I probably did it the wrong way. Actually…I simply sewed the liner to each piece (back-shirt and both front-skirt pieces) and just treated the liner side as the “wrong” side. 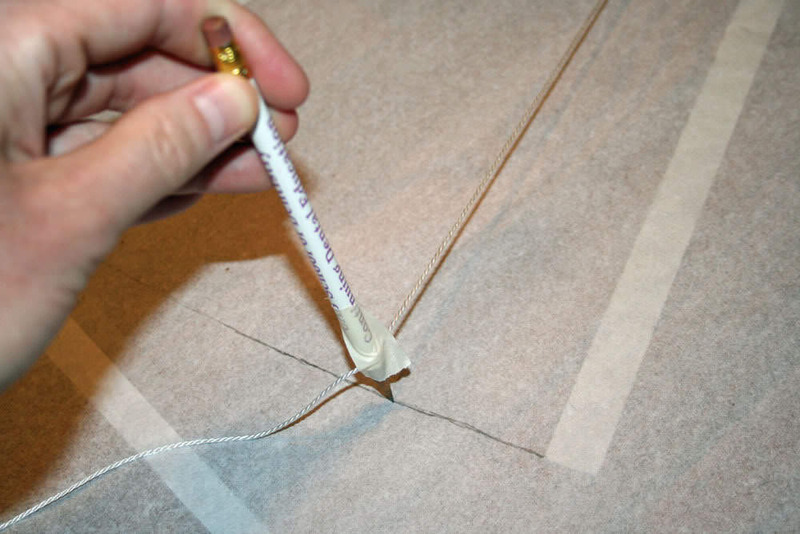 Stay stitch edge from center front to shoulder edge and ensure back neck edge ½” from cut edge in direction of arrows. Stitch front to back at shoulder seams. With RIGHT sides together, pin sleeve to armhole edge with center small dot at shoulder seam, matching remaining small dots. Stitch. Stitch again 1/8” from first stitching. Trin seam below notches close to stitching. Press seam toward sleeve. To form pleats (or the shoulder tuck) in front and back, on OUTSIDE, bring broken lines and seams together, matching small dots, as shown. Stitch along broken lines between small dots, back-stitching at dots to reinforce. Actually, I didn’t do this until AFTER I had the OT together. The last two things I did was to put in the shoulder tuck and hem the sleeves and skirt bottom. As for the shoulder tuck, I simply pinned the tuck in place. The tuck was approximately 1.5” deep. I sewed the tuck approximately 4” down the front, up over the shoulder and approximately 4” down the back. This stitch is visible, but will be later covered up by the tabards. Stitch front and back at entire under seams, matching armhole seams, as shown. 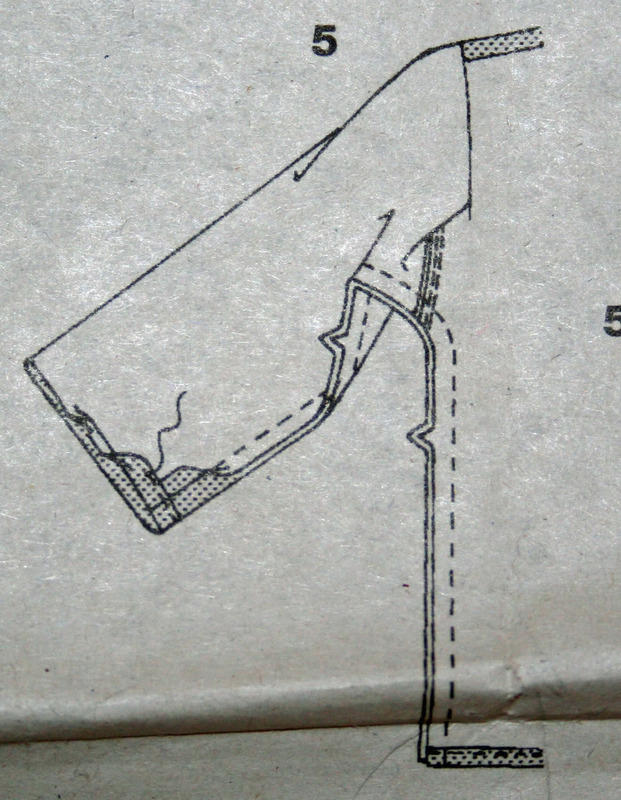 Press under hem allowance on lower edge of sleeves. To form narrow hem, tuck under raw edge to meet crease. Press. Stitch hem in place. 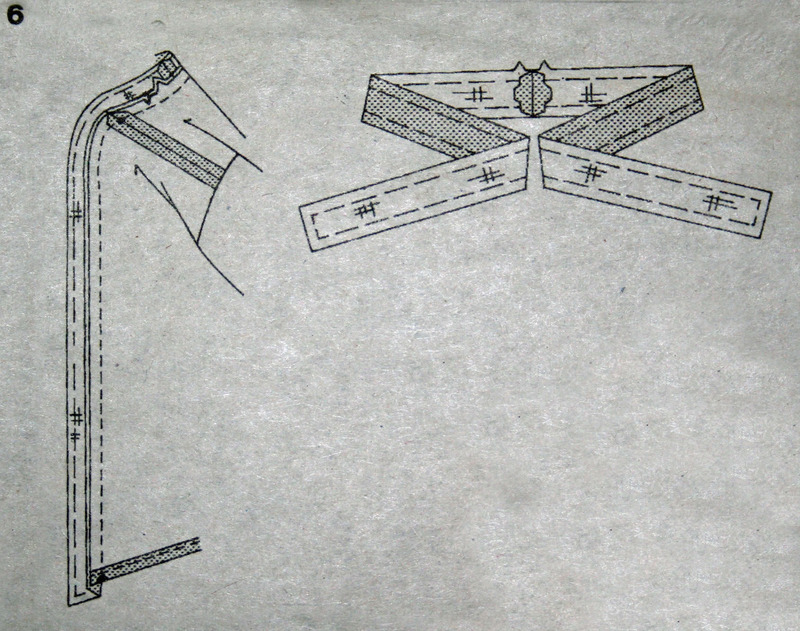 Narrow hem lower edge of tunic in the same manner. Pin interfacing to WRONG wide of two band sections. Machine-baste ½” from cut edges. Trim interfacing close to stitching. Stitch center back seam of band sections. With RIGHT sides together, pin band to front and neck edge of garment, matching centers back and notches, placing upper small dots at shoulder seams and lower small dots at lower edge of garment. (If necessary, clip neck edge of garment to stay-stitching.) Stitch. Trim seam, clip curves. Press seam toward band, pressing band out. I deviated here only in that I made the band (or collar) as one piece and NOT two pieces as the 4450 pattern says. This eliminates the seam at the back of the neck. Stitch center back seam of band facings. Press under 5/8” on long unnotched edge; trim to ¼”. With RIGHT sides together, pin band facing to band, matching centers back. Stitch lower, front and neck edges. 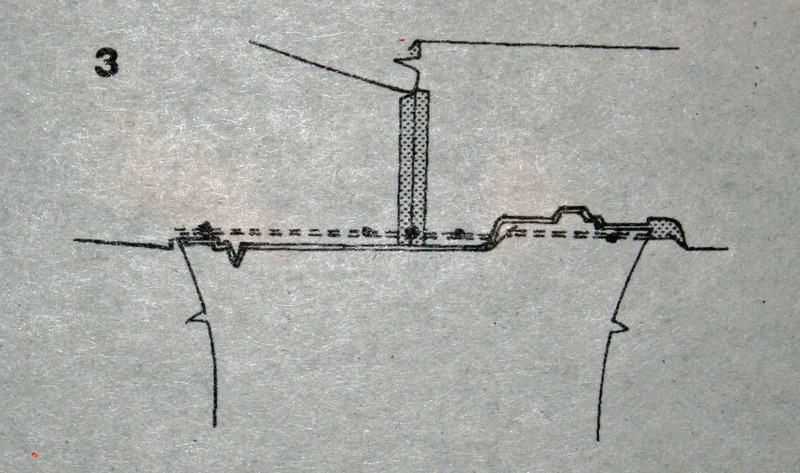 Trim seam and corners. Clip curves. Turn facing to INSIDE; press. 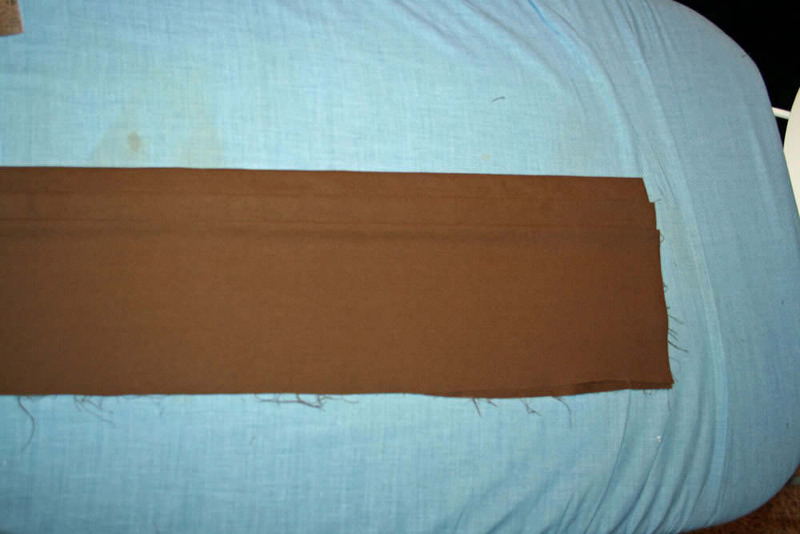 Slip-stitch pressed edge of facing over seam. Slip stitching is done by hand (or at least I did). There are some nice tutorials on how to slip-stitch on www.youtube. 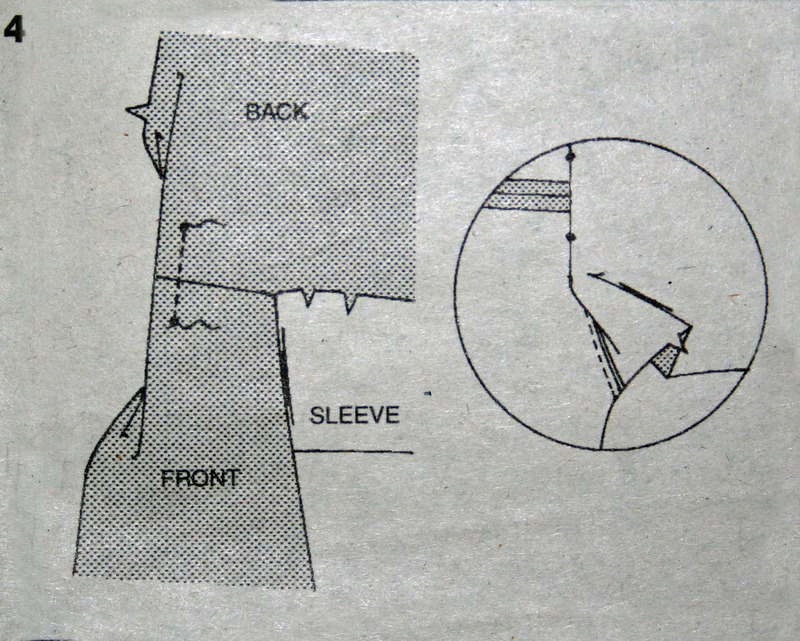 Prepare shoulder armor as follows: Pin interfacing to WRONG side of shoulder armor sections. Machine-baste ½” from cut edges. Trim interfacing close to stitching. 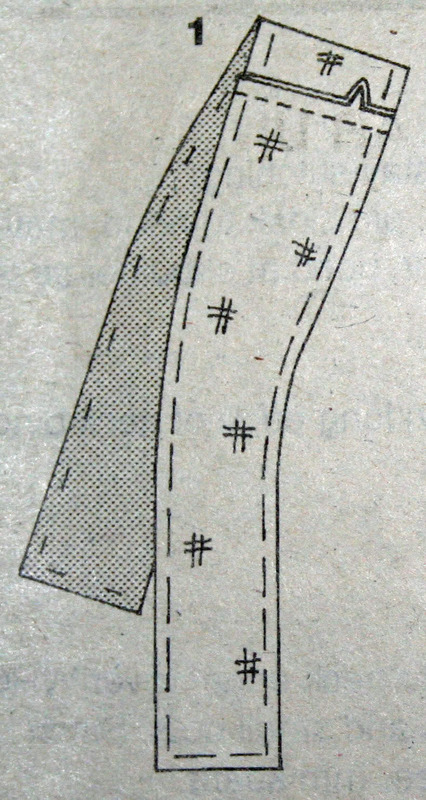 Stitch shoulder seams of tabards. Stitch shoulder seams of armor facing sections. 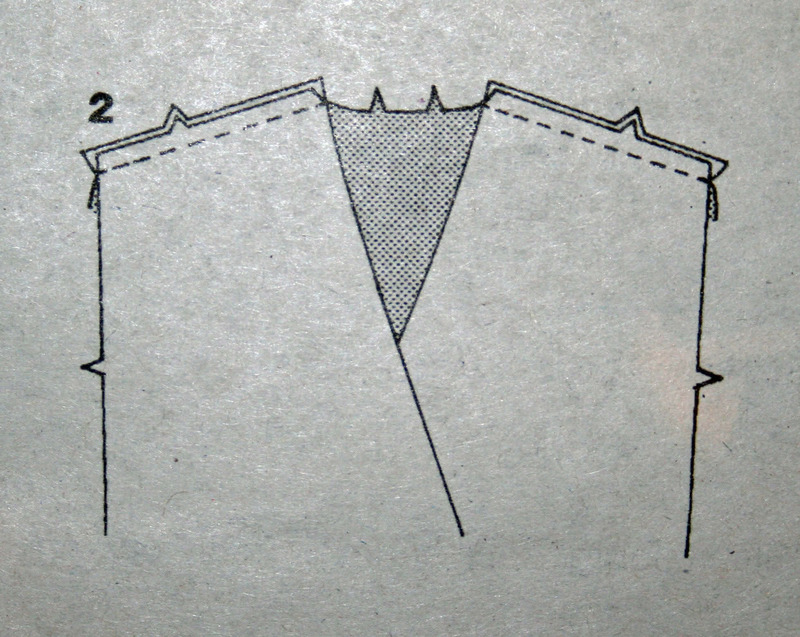 With RIGHT sides together, pin shoulder armor facing to shoulder armor, having raw edges even. Stitch, leaving an opening to turn (inside out). Trim seams and corners; clip curves. Again, I made my tabards in two pieces with the seam at the waste. There is no seam at the shoulder as shown in these pictures. 3. 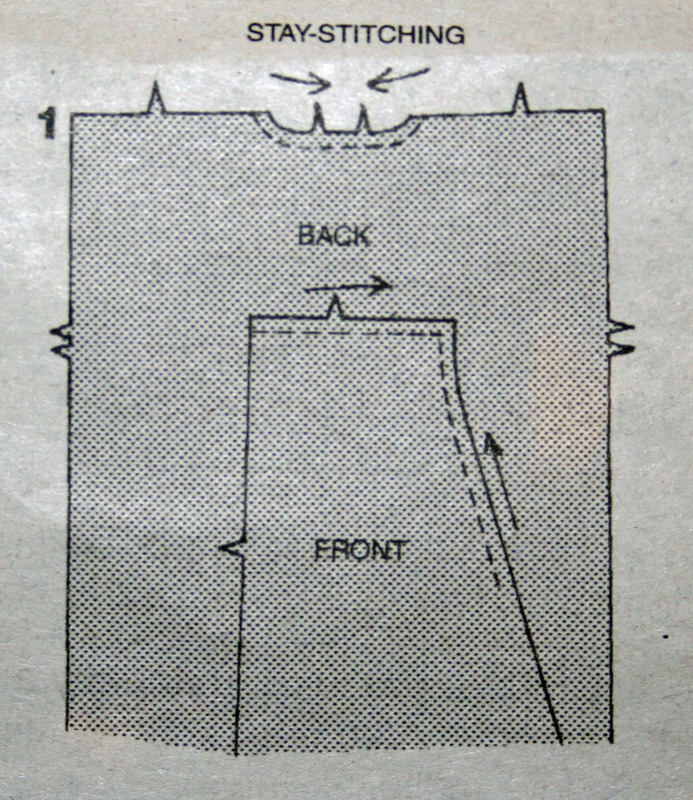 Turn tabard RIGHT side out; press. Slip-stitch opening. If you prefer, stitch close to all edges of tabards. 4. Pin interfacing to WRONG side of obi. Matching-stitch ½” from raw cut edges. Trim interfacing close to stitching. With RIGHT sides together, pin facing to obi, having raw edges even. Stitch outer edges, leaving an opening enough to turn. Trim sea. Clip curves. 5. Turn obi RIGHT side out; press. Slip-stitch opening closed. In terms of putting the OT, tabards and obi together, I chose to hand sew metal snaps. Snaps were placed at the back seam to secure the tabards at the back of the waste and at the shoulders. I sewed a 1”x2” rectangle piece with snaps to the underside of the front of the tabards at the waste seam to keep the tabards together. I made the obi go around my waste 1.5 times. It starts on one side, wraps around the front, then around the back to overlay the front side again before snapping into place on the opposite side from where it started. As for the Inner Tunic: I made several variations of the Inner Tunic. I ended up making an Inner Tunic the same way I did the Outer Tunic, but only a bit smaller and with no skirt, but long enough to tuck into my pants. The collar had three folds instead of one as described above. The visible part of each fold was approximately 1.5 cm. The sleeves were made too long, then bunched up and sewed in place. I secured the front of the Inner Tunic with metal snaps. Enjoy the tutorial. If anyone has any questions or comments, please post here or PM me! Great to have your tutorials over here, too! Can't wait for you to fill the blanks with your future tutorials. Simply amazing work Roger, thank you for sharing! WOW!!! Thank's for this great tutorial! So uh Rog, I have a question. What if you don't have the 4450 pattern due to it being completely out of production and availability to the public? Ah! That's the purpose of this tutorial! 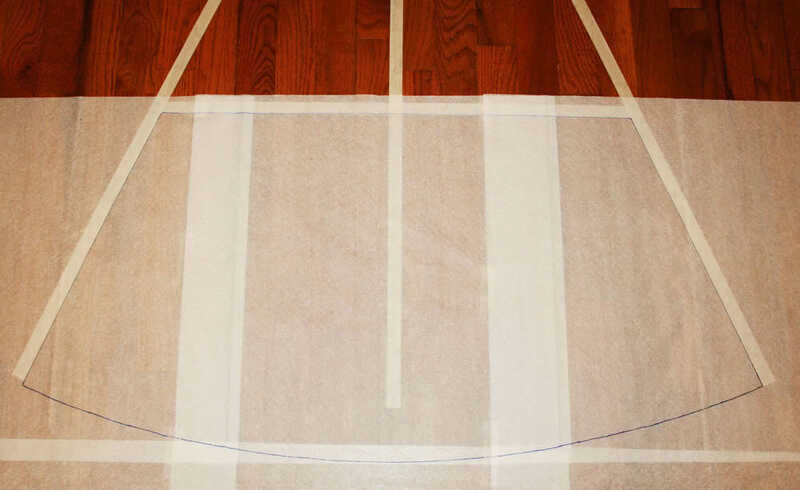 From the pictures and measurements I've shown, you should be able to draw a pattern for your jedi (well...any jedi) costume, then use that pattern to cut your material and make the costume. Folks who are similar in size to me (roughly 6' tall and 180 lbs), you can use the tutorial measurements as shows in the pics. If you're a different size, then you should be able to modify the pattern to fit you. I actually took this pattern and modified it to make a Jedi costume for a dude who is 6'4" and 250+ lbs...and it worked very well. Of course, I ran through the pattern with some old/cheap material first to make sure it was right (before cutting the "good" material). The key is to read through the tutorial carefully and do the research for your particular jedi costume BEFORE you buy material and start cutting. Writer of many costuming tutorials. 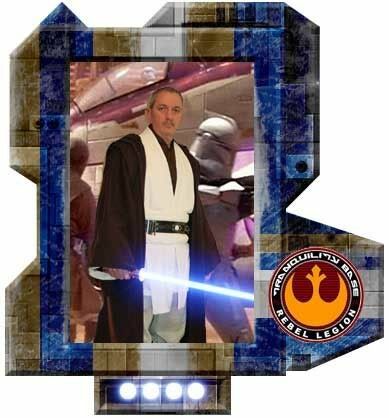 Maker of costume props and costumes for Rebel Legion and 501st members.